Ralph Erenzo didn't want to make booze. But he didn't have much choice. 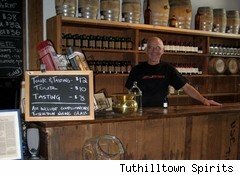 As Tuthilltown Spirits' spokesperson Robin Hayes tells it, the distillery's story began in 2001, when Erenzo bought 36 acres of land in Gardiner, N.Y. Located near the Hudson River and Minnewaska State Park, the small farm was well situated for hikers and mountain climbers, and Erenzo planned to open a bed and breakfast. Unfortunately, his neighbors weren't eager to see their tiny town overrun by outdoorsmen and took him to court. Two years later, his bank account had dwindled, and he was down to the last eight acres, having sold the rest to pay his lawyers. Desperate to turn a profit on the rapidly shrinking farm, Erenzo asked the town's enforcement officer what he could legally do with the property. New York state law allows farms to operate small wineries, so the officer suggested that Erenzo try his hand at winemaking. Ultimately, though, Erenzo did him one better: A 2002 New York State law, based on the winemaking license, allowed farms to operate small distilleries with a maximum yearly output of 35,000 proof-gallons of liquor. Partnering with former engineer Brian Lee, Erenzo became one of the first New Yorkers to take advantage of the new law, and Tuthilltown Spirits was born. One requirement of the farm distiller's license is that 50% of the distillery's raw materials have to be grown in New York state. Given Erenzo's disputes with the neighbors, one might think that Tuthilltown wouldn't be eager to work with local farmers, but the opposite was true. In the seven years that it has been in business, the company has formed a very close relationship with nearby growers, and Tuthilltown Production Manager Joel Elder estimates that 85% of the company's raw materials -- including corn, potatoes, wheat, rye and apples -- come from farms located within three miles of the distillery. The only major item that Tuthilltown doesn't locally source is malted barley, a problem that Elder laments: "It's nearly impossible to find a good malted barley source in the U.S., and shipping from American farms is expensive." In fact, Elder notes that the cheapest, most local supplier is in Canada: "It's closer than American producers, costs less to ship and has a comparable price." The barley problem has thrown a serious wrench in Tuthilltown's plans to locally source all of its ingredients, but Elder has a solution: "We want to start growing our own barley or encourage a nearby farmer to start growing it." Not only will this help maintain the company's "locavore" ideal but it'll also help the surrounding economy, an issue that's very important to Tuthilltown. Elder emphasizes that "Our heart is with local agriculture. Any development at our company is tied to local agriculture and the local economy." Elder insists that "involvement with local growers isn't a marketing strategy. It's a survival strategy." In addition to cutting shipping costs and increasing freshness, it has given the distillery an amazing level of control over its ingredients. For example, when Tuthilltown wanted to experiment with open-pollinated heirloom grain, it contracted a local farmer, agreeing to absorb the costs of the attempt. "By subsidizing the experiment," Elder notes, "we gave them enough confidence to try a project that might not pan out." These types of relationships have had a long-term effect on both the distillery and its neighbors. While Tuthilltown makes liquor from local apples, Elder notes that the McIntosh, Gala and Empire apples that nearby farmers grow aren't ideal for its uses. When a local orchard expressed an interest in developing an organic, self-picking operation, Tuthilltown convinced it to start growing heirloom apple species that were more suitable for its spirits. Elder notes that the move "Helped the farmers and helped us. We got the apples we wanted, and they were able to develop a lucrative operation." Tuthilltown has also brought outside capital into the region. Recognizing that it needed to improve its cash flow if it hoped to grow, it agreed to partner with William Grant and Sons, the Scotland-based premium liquor company that owns Hendrick's gin, Glenfiddich Scotch and Stolichnaya vodka. Impressed with Grant's lineup and struck by its commitment to quality, Tuthilltown sold its popular "Hudson whiskey" line to the larger company. Under the terms of the agreement, Grant owns the brands, but Tuthilltown will continue to produce them. While the Grant deal helped Tuthilltown to slightly upgrade its facilities, Elder points out that its biggest impact has been the massive increase in cash flow. "Previously, we were able to work when we could afford to procure ingredients," he notes. "Now we can distill constantly." On a larger scale, the relationship between Grant and Tuthilltown has also poured money into the local economy. It has funded Tuthilltown's experiments with local farmers, and the distillery's increased production has been a boon for the area's growers, whose grains feed the company's cookers and stills. Now a significant economic force in the area, Tuthilltown has also built a stronger relationship with its neighbors. Perhaps the greatest sign of this increased friendliness lies in the distillery's growing popularity as a tourist site. In 2009, following years of lobbying, the New York state legislature passed a law allowing microdistilleries to host tasting rooms and offer tours. To celebrate, Tuthilltown invited the public to the distillery, where fans had the opportunity to harvest rye and see where the grain is transformed into liquor. In the year-and-a-half since the tasting room law passed, Tuthilltown has drawn whiskey afficionadoes from around the world. But what effect has this stream of tourists had on the sleepy town that once fought against Ralph Erenzo's small bed and breakfast? "So far," spokesperson Hayes laughs, "There has been no word from the neighbors."